This panel explores how subaltern actors and communities have operated within the transnational hegemonic discourses, logics, and imaginaries of white American Protestantism to challenge forms of oppression and advocate for support. In the context of American Protestantism’s global influence and its ambitious worldwide activism, different groups of Christian actors across the Global South in the late twentieth and early twenty-first centuries have marshalled critiques of that hegemony while simultaneously trying to partner with US Protestants to secure protection, resources, or authority. In “Transnational Anxieties,” Candace Lukasik examines the effects of Coptic Orthodox Christian emigration to the United States since the 2011 Egyptian revolution, focusing on the role of the Coptic Orthodox Church, the Egyptian state, and geopolitical conditions in reshaping transnational political subjectivities and religious practices. In the midst of this contemporary shift, Copts have engaged American Protestantism on a variety of fronts—to support political efforts at alleviating “persecution” of Christians in the Middle East, to engage new forms of ecumenicalism, but also to oppose their aesthetic and theological influence. For fieldwork, Lukasik focused on three main arenas between Egypt and the United States in which Copts have adapted to these geopolitical shifts: 1) the education of Coptic youth, 2) mission trips and clerical engagement between Egypt and the United States, and 3) Coptic political activism. In “Missionary, Go Home,” Hannah Waits traces the 1970s and 1980s global clashes between American evangelical missionaries and missionized communities throughout the Global South that challenged missionaries’ presence, methods, and epistemologies. She outlines the ways that Christians from the Global South voiced their critiques using the language of US evangelicals’ logic of individual conversion—these critics insisted that if missionaries really wanted to evangelize every person on earth, then missionaries should transfer structural and epistemological power to local Christians across the world, who could convert their neighbors far more effectively than racially and culturally foreign missionaries could. Waits also tracks American missionaries’ responses to these criticisms, and shows that by agreeing to some external changes while avoiding core transformations, missionaries embraced racial and cultural diversity while also preserving institutional whiteness within spaces in which Western white dominance was declining. Together, these presentations point to the ways that minoritized communities have grappled with and tried to exploit the discourses and logics of white US Protestantism in recent decades. 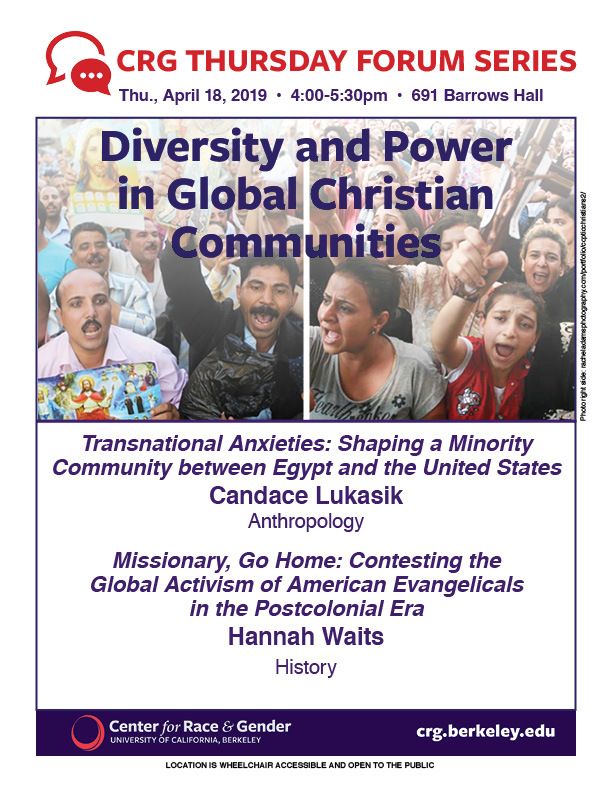 By examining those dynamics within the Coptic Orthodox diaspora and US evangelical missionary networks, this panel expands our knowledge of how subaltern groups have harnessed dominant white epistemologies and structures for autonomous ends. Candace Lukasik is a PhD Candidate in Anthropology at UC Berkeley. She specializes in secularism, migration, religious violence, and Middle Eastern Christians. Her dissertation project is entitled “Transnational Anxieties: Shaping a Minority Community between Egypt and the United States,” and explores the transnational negotiation of political subjectivities and religious practices through the lens of Coptic Orthodox Christian emigration from Egypt to the United States since 2011. For this work, she has received fellowships from the Social Science Research Council, the Louisville Institute for the Study of American Religion, the Institute of International Studies (UC Berkeley), and The Center for Middle Eastern Studies (UC Berkeley). Hannah Waits is a PhD Candidate in History at UC Berkeley. She specializes in the history of religion, politics, and culture in the twentieth century US. Her dissertation, “Missionary Minded: American Evangelicals and Power in a Postcolonial World,” traces how changes to global missionary work shaped American evangelicals’ understandings of themselves and their growing national and international power in the mid and late twentieth century. For this work, she has received fellowships from the Louisville Institute for the Study of American Religion, the Religious Research Association, and the Society for Historians of American Foreign Relations, as well as grants from numerous research centers, including the Center for Race and Gender.